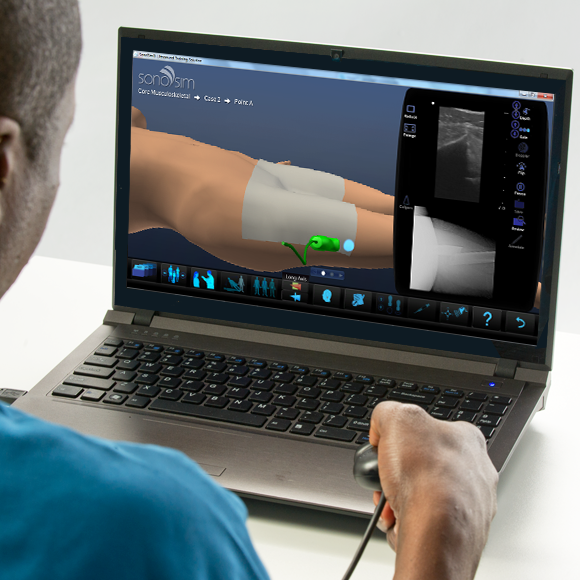 Santa Monica, CA, September 18, 2014 – SonoSim Inc., a leading provider of ultrasound education and training, has announced the official release of a comprehensive musculoskeletal (MSK) ultrasound-training package. MSK ultrasound has far-reaching benefits, allowing trained practitioners to visually assess and monitor conditions affecting bones, muscles, tendons, and other soft tissues. However, MSK ultrasonography is arguably the most difficult ultrasound imaging skill to learn and teach; the sheer number of anatomic structures, the varying imaging planes, and the dynamic nature of MSK imaging make it incredibly challenging. SonoSim has applied its proven approach of using cloud-based computing and hands-on training to provide a mobile platform for MSK ultrasound education, training, and performance analytics. This latest SonoSim release delivers comprehensive MSK training that imparts a solid foundation in MSK sonography. SonoSim uses a combination of advanced motion sensor technology and real-patient ultrasound data to provide a simulation-based, risk-free environment, where users can develop proficient MSK ultrasound skills and access refresher training to curb skill decay.